Our high performance spectrophotometers use photo diode array (PDA) technology and are available for the UV (190-390 nm), UV/VIS (190-720 nm) and VIS/NIR (300-1100 nm) spectral range. The Tidas S 300 series uses internal light sources, allowing for a compact experimental setup. The Tidas E Base series uses an external light source which customers may select. WPI’s Tidas series is a high end fiber-optic spectrometer module designed for low noise applications. 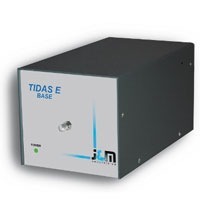 The Tidas series outperforms conventional bench-based spectrophotometers and CCD-based spectrometer modules, when it comes to high precision fiber optic sampling. It relies on a monolithic optical bench made by Zeiss, which is optimized for fiber optic applications. Most cuvette-based standard spectrometers lose more than 90% of light through expensive prism decoupling. The Tidas series is designed for fiber optic sampling cells. Using suitable light sources and sample cells, spectral detection in the wavelength range of 190 to 1100 nm can be performed at noise levels < 0.04 mAU peak to peak.